It's amazing how humans behave based on what they believe to be the state of the world. This TED Talk emphasizes how insights into human behavior are helping move people towards action on energy that helps to mitigate climate change. This simple video on climate change explains how humans impact climate and how climate impacts us. It explains what adaptation and mitigation mean and how we can be part of the solution. This page is an extensive collection of wind energy resources. It includes projects in progress, images, videos, publications, facilities and information on capabilities. This page directs users to community level strategies and provides policy anlyses, webinars, case studies and other assets to help people take action. Through the National Renewable Energy Laboratory, the NWTC works to advance wind power technology while minimizing environmental impacts and working to make wind power accessible to various levels of society. 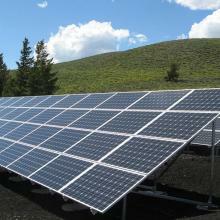 This page is a one-stop shop for information on renewable energy. It covers topics from solar to biomass and technologies from commercial to residential. NREL is an arm of the U.S. Department of Energy that works to further renewable energy technologies and make the technology and the information about the technology accessible to all citizens. This is the landing page for the U.S. Energy Information Administration. It offers the most extensive and accessible collection of energy related information for the United States.